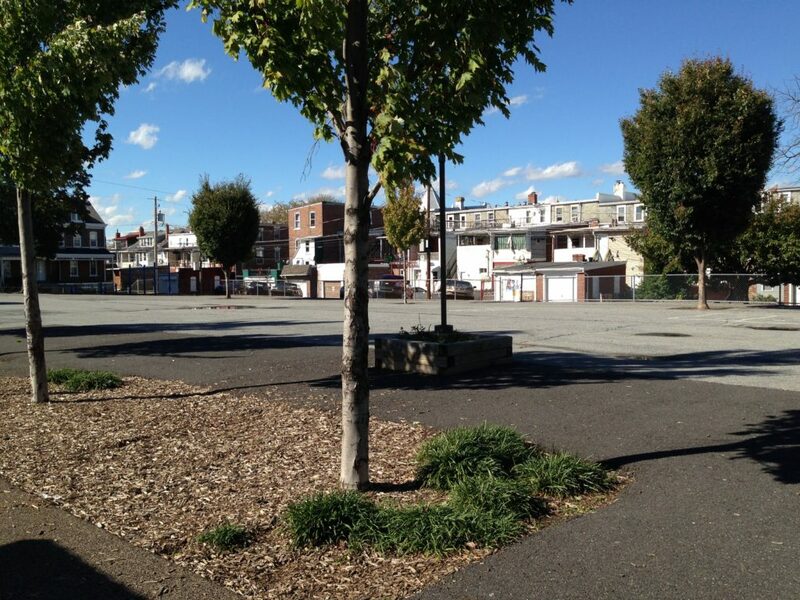 Plans for a $50,000 revamp of the playground at St. Stephen’s Lutheran Church in Allentown began one afternoon when Reverend Maritza Dolich decided not to head straight to her car. Instead, she shared lemonade and cookies from the church kitchen with local kids. Built in the 1930s, St. Stephens underwent an extensive outreach process for that new playground (finished five years ago) and community vegetable garden. An after-school program now welcomes up to 30 kids four days a week, with snacks, enrichment, homework help, and dinner. You might not expect a Lutheran church to connect with the neighborhood’s mostly Roman Catholic Latino population, but today, all the nearby families know Dolich. 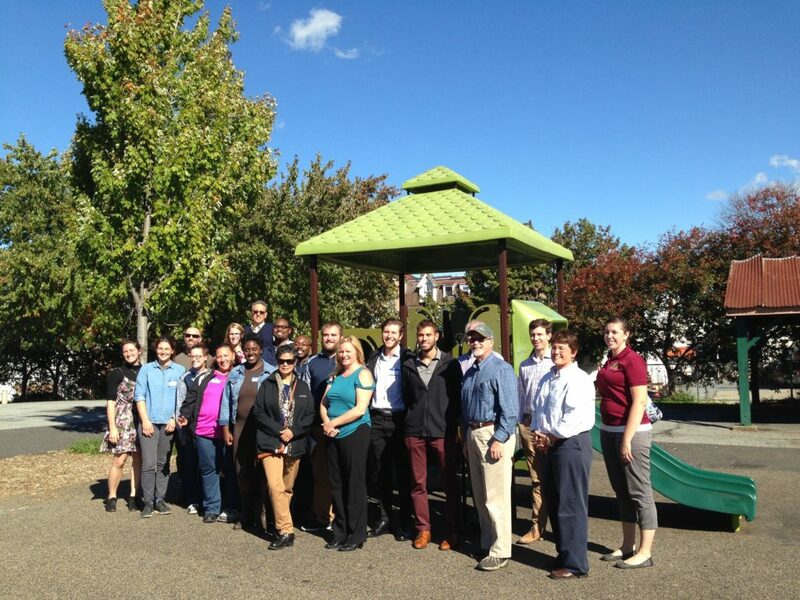 “They call me Park Grandma now,” she said at the inaugural PA Urban Parks & Recreation Exchange, held October 24 at Allentown’s Bucky Boyle Park. The Exchange, an event organized by the PA Urban Parks & Recreation Alliance’s Good for You, Good for Cities program, was also sponsored by the Pennsylvania Recreation & Park Society, the Pennsylvania Department of Conservation and Natural Resources (DCNR), and Allentown Parks and Recreation. Five speakers from three cities addressed a diverse crowd of about 35 professionals who traveled from Pittsburgh, Harrisburg, Philadelphia, Reading, Pottstown and Wilkes-Barre. 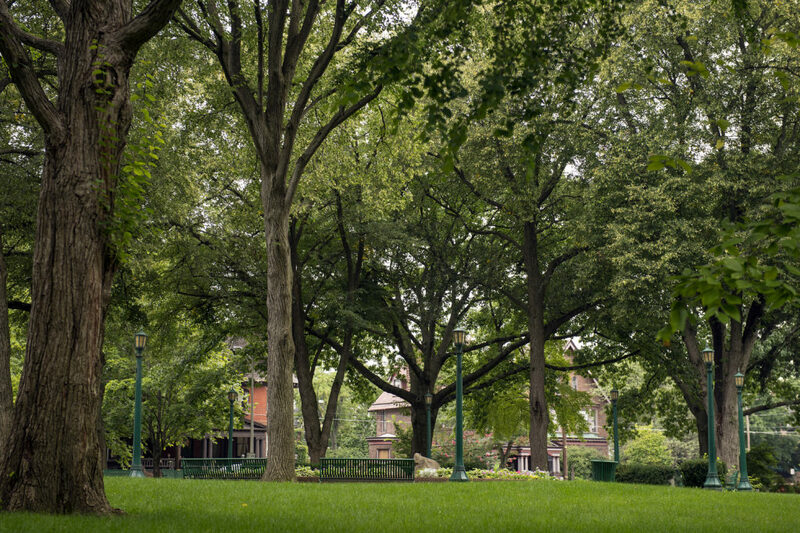 The agenda explored the roles and challenges of parks — from playgrounds and pools to green spaces and watersheds — in Pennsylvania’s urban spaces. Allentown Mayor Ed Pawlowski told Keystone Edge that he was excited to host the event in his city, which boasts 2,100 acres of parkland for its 120,000 residents, the largest park system per capita of any similarly sized city in the country. In his opening presentation, he noted the city’s many reinventions, from an 18th-century agrarian community to an 1850s industrial mecca (including, at the time, the world’s largest textile mill). A powerful retail economy blossomed in the 1970s, but commerce declined sharply in the following years; now a contemporary wave of major reinvestments seeks to grow the population and attract professional services. With an extraordinary $1 billion in development in just two years, Allentown now boasts 20 new restaurants, one million square feet of new office space, 400 new housing units, a major retail/entertainment venue, and the return of 4,000 jobs. There’s more to come, including a major revamp of an industrial-age complex fronting the Lehigh River. Public spaces evolve along with cities, Pawlowski added, and parks where citizens play, relax, connect and collaborate are necessary to the future of good development. “Where do you start? You just start,” added presenter Daphne Klahr, who leads the Reading Recreation Commission, formed in 2012 as a partnership between the city and the Reading School District. In 2011, Reading ranked as America’s poorest city, with 42 percent of residents living below the poverty line. At that time, the recreation department was a government subdivision with an annual budget under $400,000. There were no after-school playgrounds, no special events (despite pavilions ideal for rental), “crumbling” facilities, and no one to lobby for parks. DCNR brought Klahr to the new Commission from affluent West Reading, just across the river. She started with a flurry of renovations and simple improvements like new paint. She also got to work “badgering city officials,” especially on behalf of a mostly Latino immigrant population that makes up 78 percent of the district’s students. During its first year, thanks in part to intense community outreach, the Commission renovated 13 parks and opened four playgrounds. Now it has nine playground programs. According to Klahr, urban parks professionals are “standing on the gap” of cuts to many school programs, and the hardest people to reach are the ones across the bridge who aren’t Reading residents. The biggest mark of the Commission’s success so far is that it’s beginning to draw financial investment in parks and programming from outside the city limits. Taking stock of existing resources is also key. Dolich pointed to Allentown’s many church buildings, many of them under-used. She insisted that the stewards of these spaces can ensure their future only by dropping a traditional view of pristine worship facilities, and reinventing themselves as community hubs for everything from playgrounds to cooking classes, yoga and breakdancing. Focusing on work in two of Philadelphia’s poorest zip codes, her organization contends with both a digital and a linguistic divide. TFF communicates with the community in Spanish and English, and is figuring out what language (Cambodian? Vietnamese?) should be next. For residents who don’t have access to the internet or social media, outreach means lawn signs, ads in local papers, door-to-door canvassing, flyers, and phone calls. And without a formal headquarters, TFF has been piloting the “Creekmobile,” a cargo bicycle full of hands-on nature lessons taken directly to park and trail users. Partnering with other organizations is crucial. “We never do anything on our own,” said Slavet, touting a growing relationship with the nationally expanding Latinas in Motion. And community surveys have revealed that niche interests, like history or birding, engage people who might not otherwise get out into city parks. Patty-Pat Kozlowski and Lisa Whittle also represented Philly’s urban park scene. 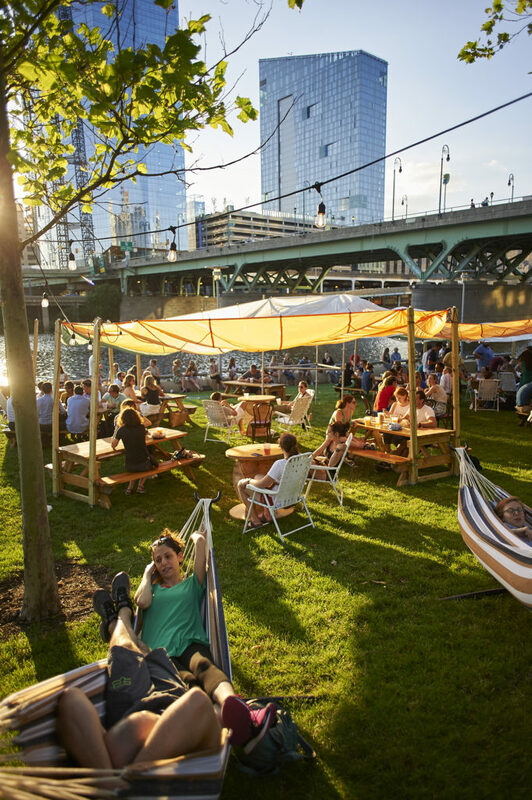 Kozlowski, director of park stewardship at Philadelphia Parks & Recreation, emphasized the balance between caring for trees and land, and running the projects and events that draw visitors. When a park without a recreation center is surrounded by city housing, who takes care of that park? In Philadelphia, the answer is often dedicated Friends groups. Philly Parks & Rec employs four full-time and three part-time “stewardship coordinators” who oversee 115 hyper-local Friends groups comprising hundreds of volunteers. Engagement is so high that people want to start a Friends group for “every traffic triangle that has a tree on it,” Kozlowski quipped. Thoughtful programming — everything from outdoor movies to cops scooping water ice — bring thousands of people out to these spaces. Whittle, program coordinator at Philly Parks & Rec, oversees swimming pools and skating rinks (the agency owns 71 pools and staffs 74 for a six to 10-week season). It’s a big job to recruit about 800 seasonal staffers annually, including lifeguards and maintenance staff. Security is also an ongoing challenge — requiring 24-hour on-site surveillance — and running a pool comes with constant safety concerns, adding up to a $2 million annual budget each summer. This dwarfs the School District’s funding for nine months of after-school programs. Many Philly pools have bare-bones cement grounds, but growing “pop-up pool” partnerships incorporate amenities like greenery, chairs, umbrellas and classes. In 2017, there were 760,000 visits to Philadelphia pools. The discussion also touched on recruiting and maintaining volunteers (collaboration with local colleges is key, said Klahr), encouraging investment among transient populations, sports programs, cultural divides, and vetting mutually beneficial partnerships. 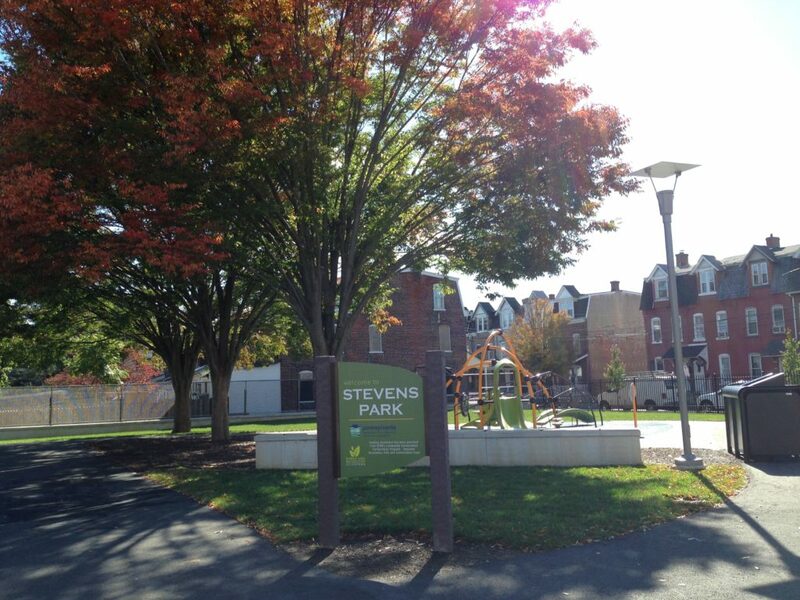 The program concluded with a tour of two Allentown parks: the park at St. Stephens, where a new master plan will tackle its existing concrete expanse, and Stevens Park, which recently re-opened after an $800,000 renovation. Attendee Michele Schasberger, a leader at the Wilkes-Barre YMCA who also represented the Luzerne County Recreational Facilities Advisory Board, found the presentations “interesting and exciting.” With a shortage of funds and staff in Wilkes-Barre, “For us, the biggest problem is…we get these ideas, and who do we share them with?” Volunteers are great, but you need sufficient staff to marshal and manage them. Schasberger, noting that Pennsylvania is mostly small municipalities and not large cities, was glad the Exchange included presenters from smaller cities. In her region, “if you tell people, ‘They did it in Philadelphia,’ there’s automatic resistance,” she explained. She found success stories from Reading and Allentown particularly compelling. Lindsay Taylor, director of Allentown Parks & Recreation, said the Exchange had a common theme. While infrastructure improvements might get the most airtime, the “consistent importance of hard work to reach out into the community” is the true mark of success in urban parks. Lead image: The new playground at Stevens Park in Allentown, reopened spring 2017 after an $800,000 renovation. Keystone Edge Publisher Greg O’Loughlin is a founder and partner at SWELL, LLC; the company is the advertising agency behind the “Good for You, Good for All” campaign, in partnership with PRPS and DCNR.